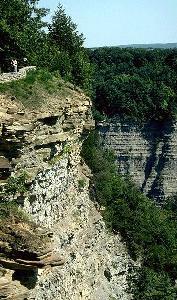 Letchworth State Park is sometimes called the "Grand Canyon of the East." Although the nickname exaggerates its scale, this 22-mile long segment of the Genesee River is nonetheless a place of great scenic beauty. It contains three major canyons and two valleys. The middle canyon, the Great Bend Gorge, is up to 550 feet deep. The Portage Canyon, located at the southern end of the park, contains three major Genesee waterfalls. A large number of streams flow into the park, and create many smaller waterfalls as they tumble down the cliffs. These minor waterfalls are the highest falls in New York State. Six of them are more than 100 feet higher than Kaaterskill Falls, which is often listed as the highest waterfall in New York. Several of the minor falls are 500 feet high. The park is named for William Pryor Letchworth, who purchased the core of the park to preserve it. He built a home, Glen Iris, overlooking the 107-foot Middle Falls (shown at right). He later gave his land to New York State for use as a park. That land forms the core of the current park. Later additions have increased the park to over 14,000 acres. The current park contains the entire Letchworth gorge, and stretches from Mt. Morris to Portageville. One of my favorite places in the park is Inspiration Point. It provides a beautiful upstream view of the Portageville Canyon. The powerful Middle Falls are in the center, with the Upper Falls peaking around the corner above them, and the railroad trestle in the background. I have two more web pages of Letchworth photos. One focuses on Letchworth's waterfalls, the other visits Letchworth in the winter.